Earlier this year, the Esri Canada Centre of Excellence (ECCE) App Challenge was won by UW Team SDS for their transit and routing app PredictION. The team’s prize included a trip to San Diego for the Esri International User Conferences. Maju Sadagopan, one of the members of UW Team SDS, reflected on his experience during his trip to the conference. Several months after winning the 2015 ECCE App Challenge, our team was able to reap the fruits of our labor and take a trip down to San Diego for a surreal experience with one of the biggest names in the GIS industry. The annual Esri International User Conference (UC) gives participants an inside look at the latest technologies within Esri’s development pipeline. The UC is a fanfare of the latest GIS technologies developed by Esri and many of its partner organizations. As a student, it is always interesting to know what the industry is doing, but the Esri UC also allowed me to get an idea of where the spatial industry is heading. 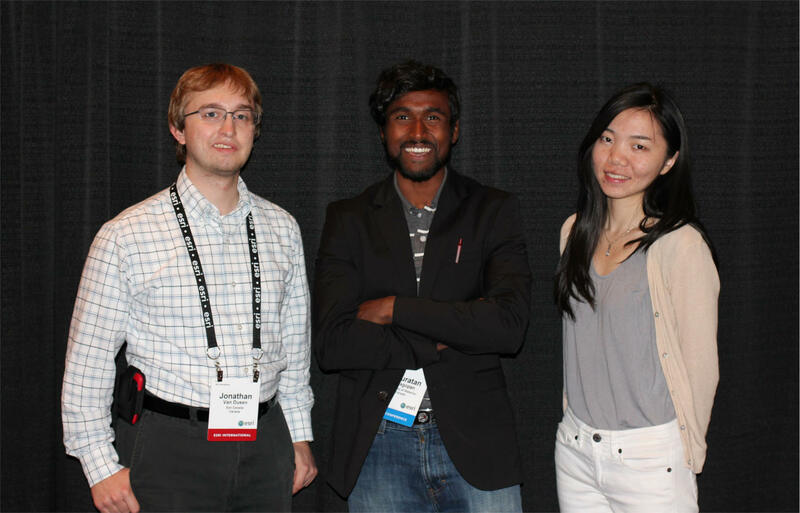 Jonathan Van Dusen (left), Maju Sadagopan (centre), and Ashley Zhang (right) celebrate their ECCE App Challenge win at the Esri UC. Coming from an urban design background, the proliferation of 3D GIS technologies was particularly exciting to see. One of my most notable experiences at the Esri UC was the opportunity to use the Oculus Rift in conjunction with Esri CityEngine. The demo was much like a scene from the Matrix – one moment I was in a crowded conference hall, and the next moment, I was in an empty city roaming around haphazardly as I try to get used to movement in virtual space. It’s stunning to see where GIS is headed already, and one can only imagine where it will end up. As a designer and cartography enthusiast, I was also very excited about vector tiles, a technology pioneered by Mapbox. Vector tiles make it possible to publish styled multi-layered maps as tiles in vector format that can be efficiently rendered by a Web browser and styled on the fly. The last piece of technology that impressed me was the general increase of integration between ArcGIS and other enterprise software systems such as Oracle, MySQL, and other major vendors. 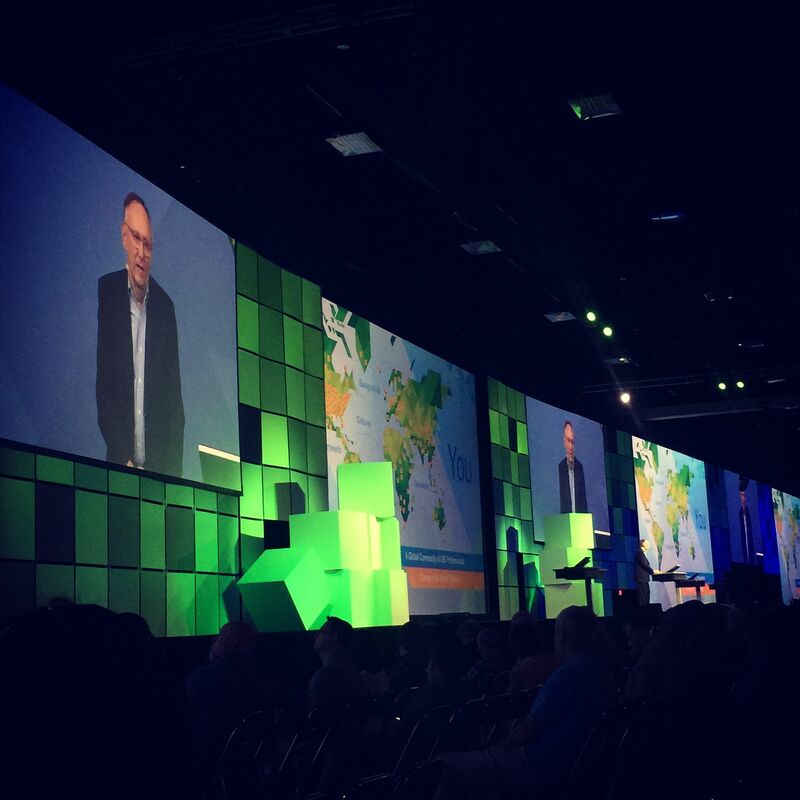 Going to the Esri UC taught me how much more I have to learn of ArcGIS and its full suite of capabilities. Despite all the tech wizardry at the conference, the most interesting aspect was undoubtedly the people that I met at the conference. The UC is a unique mix of technology creators and technology users, all with varied backgrounds and experiences. I had the opportunity to meet some very experienced individuals in the industry such as a manager from the City of Chicago who was at the forefront of GIS when it was first introduced within municipal agencies for the purpose of tracking crime incidents. Despite the drastic change in technology over the years, it was apparent to me that some ‘new’ ideas have been around for quite some time – they were simply implemented in a different manner. Maju’s perspective attending the Esri UC plenary session. Another notable group of individuals that I met were the talented folks from the Esri UX team. GIS is moving away from its past of cluttered interfaces and static maps to build application experiences centered on people, projects, and scenarios. I went to the UX (User Experience) booth every single day of the conference, and I had the chance to get some excellent career advice on breaking into the UX/UI design industry from a GIS perspective. Another great encounter was having the opportunity to meet the developer who made it possible for our team to build our ECCE App Challenge winning app PredictION, and head to San Diego. Melinda Morang, the developer behind the GTFS add-on for the ArcGIS network analyst, presented at the conference and my teammates and I had a quick chat afterward. The Esri UC was an amazing experience, but one of the best aspects of the conference was ironically the opportunity to connect with the Esri Canada team. Overall the conference was a great experience in an interesting city, and the experience has kept me excited and motivated to come back to the conference next year by possibly winning the ECCE App Challenge again or attaining the Esri Young Scholar award.